Like many would be pole aerial photographers I have run the gamut from thinking about purchasing commercial adapters to DIYing one. Problem is that a commercial adapter only works on certain pole types (painter's poles typically) and specialist DIY rigs for carp poles won't work on anything but carp poles (or equivalent diameter). 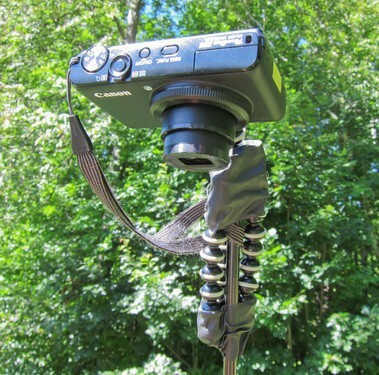 I found a earlier post in which a flexible griping tripod was used on a carp pole (see below). I went out and bought a small Targus Grypton from Wal-Mart for $9.00 and easily attached it to every type of pole I had. The "agility" of the rig makes Nadir, oblique and interesting selfies very easy. I do recommend (as in the earlier post) that you use gaffers tape or rubber bands to secure it even though these things can grip well (or some other backup method of securing the tripod to the pole). Given the variety of flexible tripod types (with larger designs able to hold multi-pound DSLR/camcorders) they should be seriously considered since, unlike a specialist adapter, you can take them off and use them on other pole types or just use it as a tripod. For the same money or less for a specialist adapter, DIY or commercial, you get a multifunctional item. I'm not sure where but I have even seen some made into KAP rigs. Hope this helps would-be pole-mappers and PAP enthusiasts. We're hoping to run a "pole hack" session at the Gulf Coast Spring Fling to make it better! Keep up the good work and keep us posted on what you're up to! I'm very happy with the results I have gotten with the flexible tripod. All manner of angles can be created making for a very useful photo platform. I have mine on a 2-4 meter painter's pole. I have been looking at the photos from the post you linked. Are you using PVC pipe and do you have any more details of your rig? I really like painter's poles (low bending and fairly cheap with a 8-23 foot one costing $39.00) though if I had access to a 7-8meter carp pole I'd immediately switch to it. Now we're making some modifications to it, like the ones highlighted in the link I posted. Also the tethers we are using are new. Since our pole was a good bit higher (and heavier), we added 3 tethers to it for people to keep it up above the site while it captures images. You can see how we use them in that post. That is a really interesting idea to stabilize and add strength to the pole through tension rigidity with those tethers. Allows for a very lightweight pole to be used. Really fascinating. I'm typically alone so I have to op for heavier, more rigid setups but believe me when the wind gets above 10mph I wish I had some helpers. Are you planning on doing just mapping/structure-from-motion or more botany related testing like NDVI? Glad to hear people are sharing the post. Fascinating paper. I may have missed it in the document but what height were the images taken at? If you were using a "go-pro pole" those are about 4 feet or so, though if you use a fanny pac in a manner similar to a flag carrier you could easily get 8 feet or more. Painter's poles like the 4-8 foot or the 6-12 telescoping can expand you coverage many times over (something like 192+ square feet at nadir with my camera at 12 feet) though soon Public Lab will offer the stackable Carbon Fiber Carp Poles which get a usable height of 6-8 meters (19-28 feet with a standard point and shoot) and cover a area over a thousand square feet (at nadir depending on focal length and sensor size). Your paper was really interesting. I'm re-reading it multiple times to glean as much information as I can. I have suffered similar issues even at 12 feet+ though this article http://adv-geo-research.blogspot.com/2014/02/camera-geometries-for-structure-from.html and here http://adv-geo-research.blogspot.com/2014/10/camera-geometries-for-sfm-update.html have helped me quite a bit. Your point clouds are still far better than anything I have yet gotten and quite impressive in comparison to LIDAR and UAVs which are likely hundreds if not thousands of times the total cost of your rig. Bravo! Your research is very interesting and I would be eager to see any similar work. I will post a number of good PAP links below. Cheers!